I have been looking forward to the second Batman movie since the last moment of the first one. I love (Potential Second Husband #6) Christian Bale's incredible abs lips acting skills; his take on Bruce Wayne & the Batman are by far the most intense and meaningful. [Shut up, I do so like the story & performance as much as the body shots]. And when I heard Potential Fling #6 Heath Ledger would be the Joker, I was completely sold. The initial previews released last fall were thrillingly spooky but once Heath died, they were positively eerie. I've still been waiting anxiously to see the movie, but I've also worried that I would be overcome with sadness. How crazy is it to be so broken up about the death of someone I never actually knew? But the truth is, great actors make us think we know them - their performances bring us into their worlds whether we like it or not (a cheating cowboy, a heroin addict). And they can turn a mediocre movie (A Knight's Tale, Casanova) into a delightful time. We saw The Dark Knight tonight and it was sad to watch this amazing actor tear up the screen, knowing it will not happen again. Heath's Joker is like none other; he made the insanity truly terrifying, because we were riveted to his character's every word & move. And Christian was again intense and noble; Gary Oldman as Lt. Gordon so likable and noble; Aaron Eckhart solid and reluctantly noble; Maggie Gyllenhaal smart, brave, and beautifully noble (a welcome replacement of the bland Katie Holmes, if I may just say). But it really was the irrational, bizarre nobility Heath brought to the Joker that made Gotham come most alive. Which is, of course, sadly ironic. This cast is amazing. I am looking forward to seeing it. 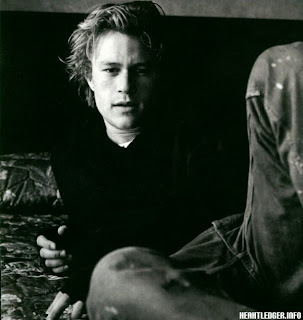 Heath Ledger was a very sweet man. What! No post on BlogHer! Just kidding...enough. enough. I LOVED Batman. I had to pee have way through the movie but could not leave my seat. I was absolutely mesmerized and terrified by Heath's Joker. Wow! And Christian Bale left me panting a little. I agree with you 100%. We just saw it Sunday and were completely blown away. Heath Ledger was a genius in his own right and will be greatly missed. I really wanted to see it before but based on your review, now I'm dying to see it! Thanks. Thanks for making me tear up. Damn it. I think it was ironic that EVERY laugh that movie got was from The Joker, and they were mainly laughs to relieve the tension! The pencil? The truck? The nurse? I'm going to see it again tomorrow night at the local IMAX theater. btw...did you redo something? You're not showing as updating on my google reader. I was coming over here to check up on you-you haven't been showing up in my reader. This post is timely-I was just thinking about HL this afternoon. I haven't seen the movie yet, but I will. Wondering when it will be released over here...can't imagine it being much longer. I too am looking forward to seeing it...and being the only person (unless there are other foreigners in the theater at the same time) to laugh at the jokes!! !